Are you looking for team building in England? Spy Games gives individuals, corporate clients and children the opportunity to experience the exciting world of espionage and secret agents. Established over 12 years ago in Milton Keynes by ex-SAS personnel, Spy Games has built a worldwide reputation for offering team building activities, corporate team building events and spy themed team building of the highest quality, in a safe, controlled and fun environment in England. We strive to make every Spy Games team building experience as close as possible to the real thing - using ex-Special Forces personnel, realistic scenarios and the latest kit, to bring the whole session to life. 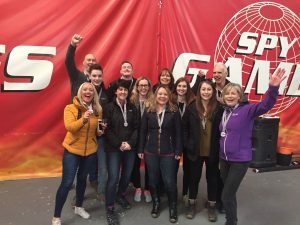 Spy Games organises events all over the world including corporate team building events, stag and hen parties, individual gift experience spy days, school experiential learning, product launches and film releases. Corporate Team Building Events in England - Team building events and activities for companies, including fun away-days, incentive programmes, bespoke corporate team building activities and adrenalin fuelled team building events all over the world. Stag Parties, Hen Do’s & Gift Experiences in England - Gift experiences for individuals, as well as stag parties, hen do’s and team building private parties for groups of all sizes, including bespoke events created just for you. Kids & School based Spy Themed team building in England - Offers children from 8 years old the opportunity to train as top secret agents! We offer gift experiences, birthday parties, team building spy camps, school experiential learning and team building for all abilities. PR Promotional Launches in England - Creates bespoke events for PR agencies and corporate clients to promote the launch of any product ranging from feature films and computer games to the latest technology and consumer products.